John Cole is not the one to piss off, lol. PAYPAL IS THE WORST COMPANY IN THE WORLD. Before the ballpoint pen, there was a time when fountain pens were elegant tools that made a wide line down the back of an L and a thin one as it slashed across its bottom. Very nice story from the Tulsa World on fountain pen restorer and replica maker Chris Thompson and his son Wade. Thanks to Jack/Youngstown for pointing this out to me. 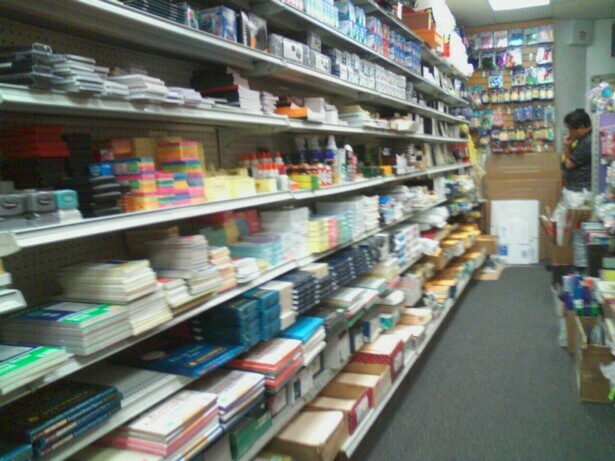 One of my stops on the way home is the 14th Street Stationery Store near 1st Avenue. 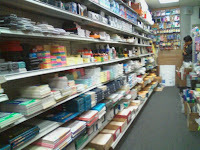 Lots of Rhodia and Exaclair, and tons of other notebooks and journals! One of my favorite pens is the golden orange Tombow rollerball I bought some time back from Amazon. I had seen the fountain pens on JetPens, but really wanted to see one up close before deciding. On a recent trip to Univesity Stationery I saw several Tombow Object pens, and one happened to be a fountain pen with a medium nib. Amazingly low price and the dark forest green color which I didn't recognize made me think these had been around for some time and forgotten until I asked to see them. The medium nib is actually quite nice, and instead of a converter I'm using Pelikan blue-black ink cartridges (something I didn't remember until I flushed the pen to re-ink it). I have to say this was the easiest fountain pen I've ever cleaned, and I don't know if that's due to the manufacturer (Tombow) or the ink (cartridge vs. converter). I can't see why a cartridge would have less ink flowing to the feed than a converter, but the assembly cleaned perfectly. Perhaps it is the ink, though I use different types and have the same problem. Some of the pens I've used take 3 to 4 intensive cleanings to get all the ink out, but this Tombow was sparkling after only one long wash. 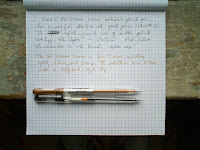 I really could not believe the feed was ink-free, but it was and I simply snapped in a Pelikan cartridge and started writing again. 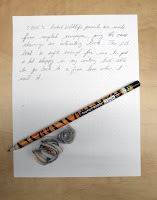 One of the pluses of having the golden orange roller ball and the fountain pen is that I can move the different systems around and put the rollerball into the forest green barrel or take the fountain pen nib and feed and put it into the golden orange barrel. The Tombow fountain pen works well, didn't have much skipping or dry ink problems at all (unlike a certain Parker pen I've been using) so when I go to write I don't have to scratch the paper a dozen times and move the pen up and down to get ink into the feed. JetPens has the Tombow fountain pen at a reduced price, so if you're thinking of investing in a great pen take a look at this one. 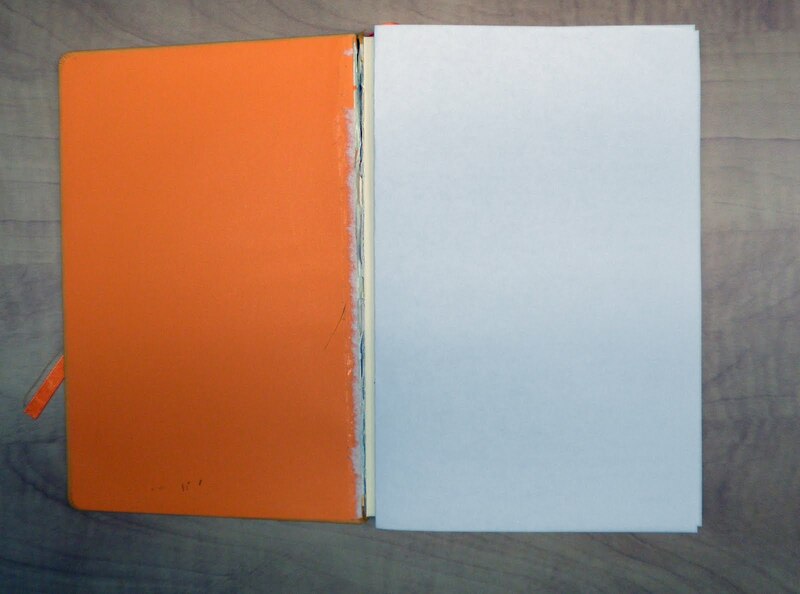 Some journals, like Rhodia's Webbie (right) and Lett's Rush Notebook (below left), are constructed so that the first page is pulled to the left just by being glued to the cover. I'm not fond of writing on that first page, as it's uncomfortable and inconveniently placed. But I also don't like leaving it plain and unwritten, either (the Lett's is an example of that). Unfortunately, removing the page doesn't work either--there's a huge tear mark on my Rhodia Webbie that's unattractive and distracting. Is this an issue for anyone else, and if so what do you do? 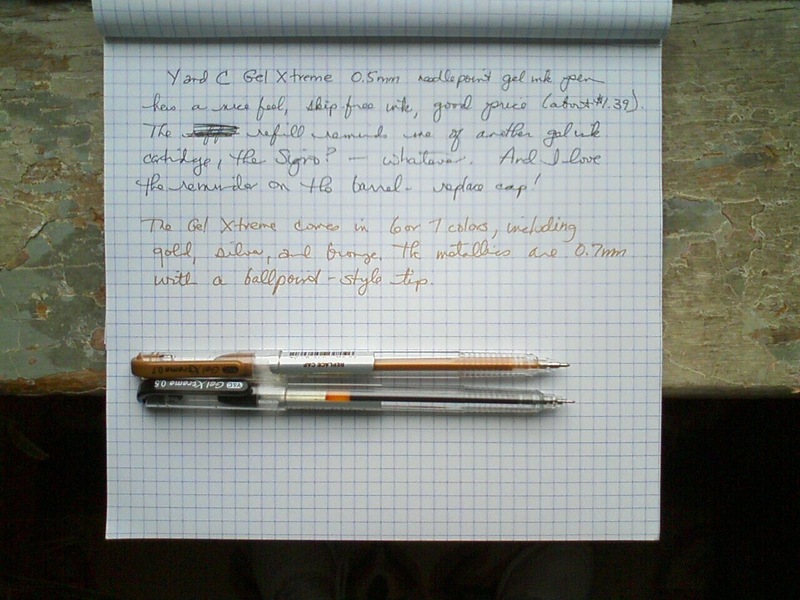 The Y&C Gel Xtreme gel ink pen can be found at most stationery and craft stores, as the pen comes in a standard 0.5mm size with black, blue, and a few colored inks as well as in a 0.7mm size for metallics (gold, silver, and bronze were the ones I saw available). What I like is the 0.5mm tip has a needlepoint tip, so I have a line that's wide enough for my taste with a thin tip that gives it a bit more style. I like the barrel as well, a thick, rounded plastic with a comfortable beveled grip area. The 0.7mm metallics are fun, I don't remember if the above is gold or bronze (I think the latter) but they glide over the paper (Rhodia's Le Carre large pad) and the ink is shiny enough to stand out from the graph lines. The Y&C Gel Xtreme pens are skip-proof, and the $1.39 price is right too. The NuWave uses conduction, convection, and infrared to cook. My dad loved using it, but found it wasn't that great for pizza or a few other things. It wasn't gathering dust, but a problem arose with my gas stove and I was in need of alternatives for the time being. So dad sent me the NuWave Oven, complete with Extender Ring kit and other goodies. If you have a BJ's near you then you've probably seen the NuWave or the Total Chef Oven, but I'm not into cooking stuff so I never gave it a thought until this massive box arrived. I'm a so-so cook, usually the problem is inattention (had ADD been around decades ago, I would have been diagnosed as the dreamy type rather than the hyperactive kid). There have been times when I've had to get out a stepladder and turn the smoke alarm off 'cause I was making burgers and knew the cats would freak when the beeping began. So I was beyond suprised when I tried out the NuWave and...it worked. It worked really well. The pork roast I made was exactly as I wanted it (see above pic), done but not dried out. I've been playing with this for several weeks now and can't believe how easy cooking has become, and how quick using the NuWave. I'd rather spend my time writing with my fountain pens or reading on my iPad, but not I have a rally cool toy to cook with and that's almost as good! The CoolNotes product line by teNeues is a Moleskine-like journal that comes in various sizes and color schemes, including colored elastic bands to complement the solid color of the journal--a detail I quite like as it acts as an accessory to my little black notebook and gives it a bit more style. I recently received a small CoolNotes journal to review and, overall, quite liked it. For some reason my pocket-sized Moleskine decided to hide, so I can't do a comparison of the two. The CoolNotes is definitely smaller than the Moleskine, measuring in at 3 9/16" by 5 1/4" versus the Moleskine's more regular 3.5" by 5.5" size. (In the picture above you can see the CoolNotes is almost the same size as my capped Lamy CP1 Fountain Pen). The CoolNotes and Moleskine are both hard cover journals with an elastic enclosure, each has 192 pages (96 leaves) of high quality paper, a ribbon books mark, a front page for contact information, and a back pocket that expands to hold receipts, tickets, photos, etc. 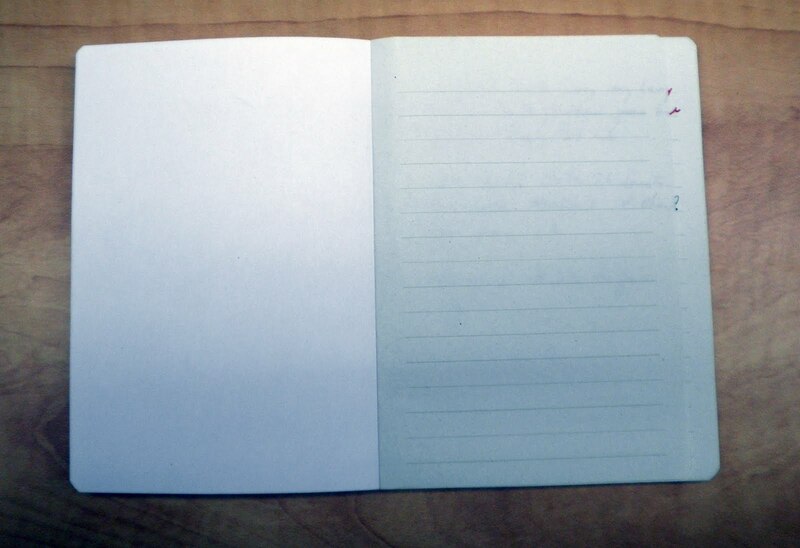 The CoolNotes journal has one major difference from the Moleskine: on the 96 leaves, the front side is lined while the back is blank. (Whenever I see something like this I automatically think: an Air Sig n designed this. Because choosing one or the other can be very difficult for the Libra, Aquarius, and Gemini-born.) I do like this detail, it seems to give me a choice of how I'm going to write something (blank sheets are more freestyle for me, they take greater discipline to use while lined reminds me of grade school and the teacher looking over my shoulder). The paper is nice, roughly 80gsm I'd guess. After a lot of pressing the journal did stay flat--mostly, kind of, generally, define "flat." As you can see in the picture to the left, the page is starting to lift , and that's after at least half a dozen pressings. 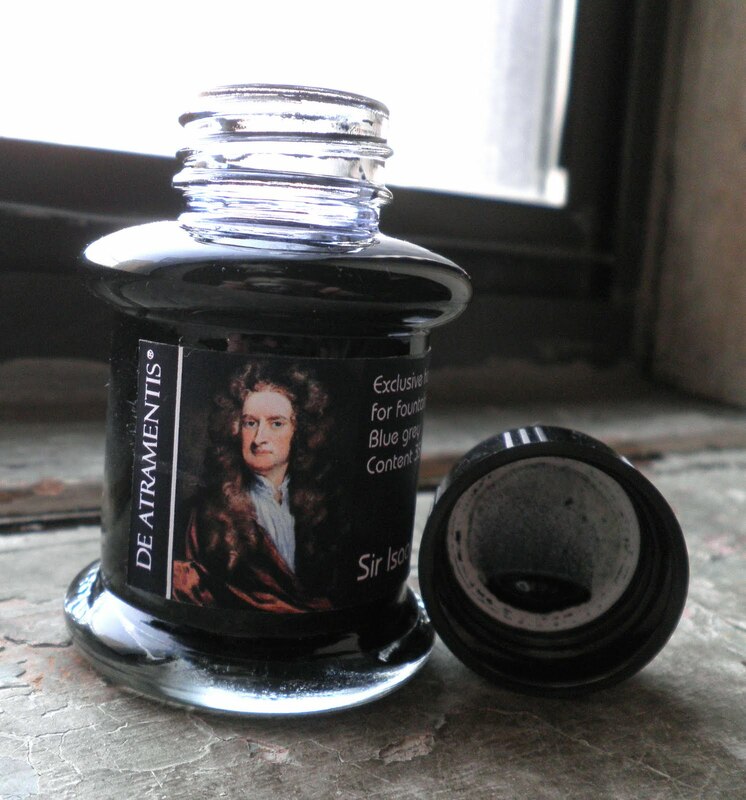 The black gel ink pen I used left a a heavy shadow on the back blank page, as did the fountain pen containing J. Herbin 1670 Rouge Hematite ink, but there was no bleed through of either. The big question is this: if I hadn't gotten it for free but had to buy it, would I? The answer is yes, if my Barnes and Noble stocks them I definitely will. I'm not sure I'd buy online as the shipping fee is usually too high for my liking, but I'm in Manhattan and can afford to be choosy. If I were back in Allentown, PA, I probably would be online hitting "checkout not" and not worrying too much about it. I am seriously looking forward to the Fall teNeues lineup for one item in particular: the new CoolNotes Flip Pad. I have reviewed Moleskine's Reporter Notepad, a large hardcover flip pad that I wanted to like but found to be only so-so. It might be that the softcover Reporter is a better notepad, but the cover was only one problem I had with the Reporter. So if the CoolNotes pocket sized flip pad has a fountain pen friendly paper and is stylish as well, that's something I really want to see. I'll be looking for them in the stores that carry teNeues: Barnes and Noble, the Musuem of Modern Art gift shop, The Guggenheim, AI Friedman, and Paper Presentation, and maybe have a review of these new notebooks. Hey Erin C, You're Right About That Iroshizuku Ink! The syo-ro does have your name all over it, 'cause your 15th comment was the winning number. Congratulations on your one-year anniversary. That color has my name all over it! Thanks for the chance to win one of these lauded inks. Thanks for stopping by and posting, and congrats. Send me your shipping information via email (diane.fennelATgmail.com) and I'll get this out to you on Monday. And thanks to all for the birthday wishes, it's been a fun year. Stopped by Art Brown yesterday afternoon and checked out the various De Atramentis Historic Person inks they had available. They were all out of Sherlock Holmes, but had many bottles of Sir Arthur Conan Doyle (Oriental red) as well as Sir Isaac Newton (blue grey). Why these colors in particular I haven't discovered yet, but they both seem to fit the historic person. Sir Isaac Newton is an intense blue grey, like the sky during a thunderstorm only deeper. 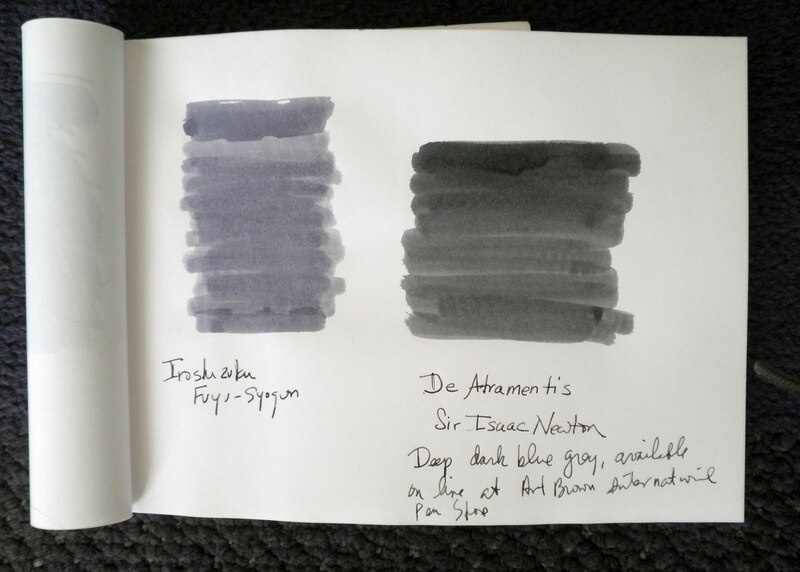 Next to the Iroshizuku fuyu-syogun, also described as blue grey, the Sir Isaac Newton stands as a much deeper mixture of the two colors with more grey than the Iroshizuku. Definitely a color to try if you're looking for something a bit more interesting that black, there's some nice shading as well. The above was done on my Rhodia No. 16 notepad with 80gsm paper, using a Parker Sonnet fine nib fountain pen. Leave a comment by Saturday, August 21 by 6:15 pm EST and I'll pick one winner by random drawing. Unfortunately, I can only mail this in the continental US (liquids and all that being a bugaboo of the USPS). Prefer Fountain Pens? So Does Inspector Morse. The series is available on DVD. A few solo middle-agers with obsessive intellectual passions may recognize themselves in the occasional scenes of Morse slumped on a sofa, pouring another drink from a half-empty bottle of Scotch as he works out his theory of the murder. A colleague emailed me about a new pen she found in, of all places, the office supply closet and asked if I'd tried it out, the OptiFlow Rollerball pen by Staples. As I'm just as skeptical as her, I ran and grabbed a blue one to doodle with and can see why she's surprised and in love. This is an excellent, inexpensive rollerball that has superb ink flow (maybe a little too much) and a wide, clean line. Two tips are available, the rollerball and a needlepoint; the line width is the same for both, 0.5mm, which may be a bit too wide for a needlepoint but that happens to be my preferred line width. Whichever you want, these are available at Staples for $7.99 plus tax for a dozen which is a good buy for an awesome gel ink pen. 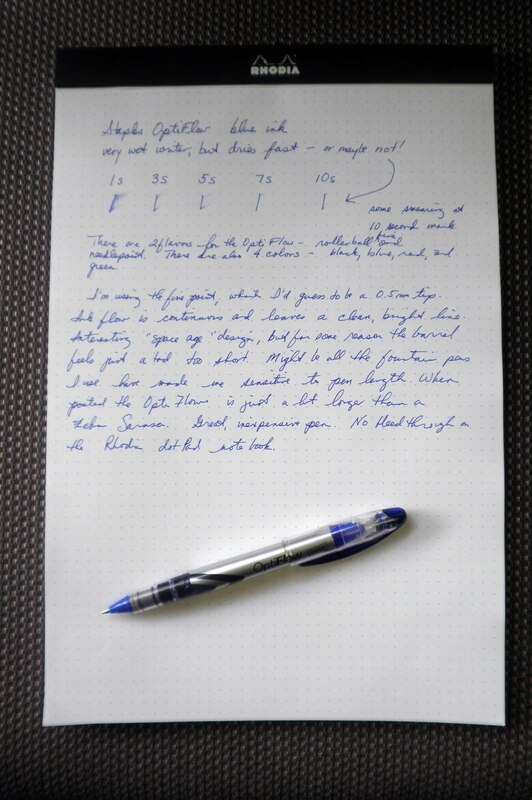 It's a bit of a wet writer and drying time may be an issue, but the design allows you to check ink availability and it's an interesting "space age" design that's not too wacky or hard on the eyes. The one issue I had was the barrel length. For some reason, this just seems shorter than my other pens. It is definitely shorter than the posted fountain pens I use, but is actually a tad longer barrel than my Zebra Sarasa gel ink pens. So for whatever reason, my fingers need some time to get used to the barrel. Other than that, a great pen and you should definitely consider adding the OptiFlow to your rotation. Within the realm of stationery and stationers there are certain names that can send me into a blissful reverie, imagining their founding when candelabras and gas lighting, horse-drawn cabs, coal engines and steamship were the order of the day: Crane's Stationery, Smythson of Bond Street, the recession-victim Mrs. John L. Strong formerly of Madison Avenue, and Lett's of London. Lett's was founded in 1796 by John Lett, a stationer who set up shot within the confine's of London's Royal Exchange (one of the most pressing needs for paper was within the financial sector). Their commercial and personal journals and notebooks are of exceptional quality and style. One particularly attractive Letts notebook is the Rush Notebook, a pocket size A6 (5 7/8" by 4 1/8") 100% recyclable paper notebook with a soft-bound cover that has an incredible basket-weave textured imprint. The paper itself has a slightly grayish tinge, and looks like the handmade paper you'd see at Kate's Paperie with the specks of color in it. The lines are a pale green, coordinated to match the paper, all of which gives this little notebook a pleasing appearance and design. There are four covers available: grass, sun, earth, and sand, and all are beautiful. So much so that I was grateful that Paper Presentation, where I found these, only had Sun and Sand available for purchase! That was really the draw for me: the basket weave texture on the cover is beautiful, and the colors they chose for their nature tones are also my favorites. I like the large "Notes" script and the recycle icon as well, not too obvious or large to be obtrusive. The paper is smooth and soft, not what I would expect from recycled. And it is somewhat fountain pen friendly--the Diamine Poppy Red ink didn't bleed through the paper, although the Noodler's V-Mail GI Green did show through a little. In the above left pic you can see my two fountain pen scribbles, and they are matched in the right pic--the GI Green doesn't bleed through all that much, but it is noticeable. Not as bad as a Sharpie I would imagine, but enough to make me re-think my choices and use lighter inks. The Rush Notebook is a soft-bound cover, and after some pressing it did lay almost flat (something I've really noticed once I tried Rhodia's new webbie). With 160 pages you've got a lot of paper to write on, so if you're a ballpoint, gel ink, or pencil person who likes to write a lot of notes I'd say this is a good choice of journal for you. Yes! Very excited at the prospect of trying out one of these new blank Webbies! A large, blank orange Webbie 2.0 will be on its way to you as soon as you contact me (diane.fennelATgmail.com) with your address. Thanks all for commenting. There will be a NEW giveaway on Wedneday, check back around noon EST. 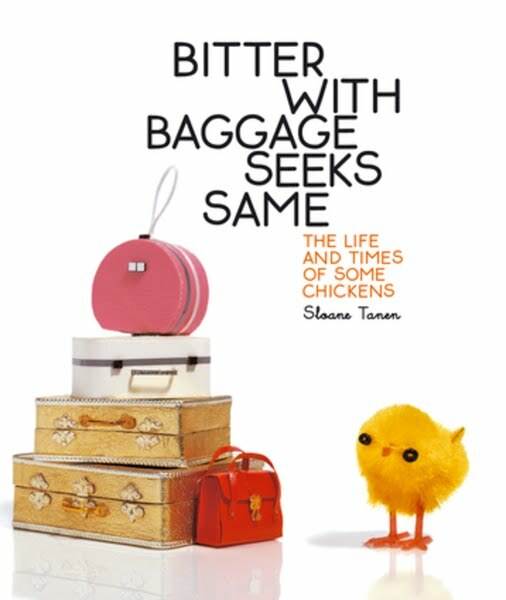 Some years back I fell in love with several snarky, funny storybooks by Sloane Tanen, a self-described 3-D cartoonist who works with chickens (1 inch plastic peeps, really). 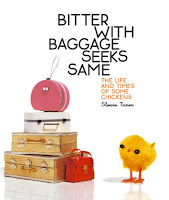 Bitter With Baggage Seeks Same and Where is Coco Going are among the wackiest coffee table page turners around, following the life and times of small, bright yellow plastic chicks complaining about shopping, calories, boyfriends, yoga classes--everything that gets in the way of a peep enjoying herself. About two years ago the New York subway system included her chicks in an art campaign on the Lexington Avenue line, an enjoyable break from the usual MTA ads. When MJ from teNeues contacted me and asked if I'd like to review their line of CoolNotes journals and invited me to look over their web site, I was really thrilled to see among their product line the Sloane Tanen QuickNotes cards featuring scenes from Bitter with Baggage. Included in the set are some of Tanen's most memorable lines and scenes, including the all over body wax (not a good idea for a chick, but no one said beauty was painless) and the inadvisability of a chick baking on the beach. When I mentioned the cards to MJ she immediately offered to send me a set, and I am very appreciative. This is a handsome set of note cards, you can see that teNeues put in a lot of thought in the overall design. There are 20 cards total, 5 each of 4 different scenes from Bitter With Baggage, with crisp, glossy reproductions on thick paper stock--ideal for quick notes and small doodles. In addition to the note cards, this is one of the most attractive and sturdy presentation boxes I've ever seen, worth the purchase all by iteslef if you're a Sloane Tanen fan (or maybe you're a fan of her father, the late Ned Tanen, a movie executive responsible for such films as Jaws, Animal House, American Graffiti, The Breakfast Club, and St. Elmo's Fire). QuickNotes and other teNeues products (like their amazing art books, e.g. The Porshe Book) are available online at teNeues, as well as at Barnes and Noble, the Musuem of Modern Art gift shop, The Guggenheim, AI Friedman, and Paper Presentation (one of my favorite NYC stationery shops). JetPens has an assortment of brush pens that have long fascinated me, so with a recent order I decided to add a Kuretake Brush Writer Blendable Color Pen in Persian Blue. I loved the color, and thought I'd have some fun trying out this brush pen. Back in April, I wrote about the Kuretake Bimoji felt tip brush pen noting that it wrote quite smoothly and didn't bleed through the Rhodia paper. In addition, it looked like a traditional wooden brush pen with a faux plastic finish. The Kuretake Brush Writer is just as nice--great color, fun to play with, the calligraphy brush pen uses a water-based ink, and there's no bleed through with Rhodia paper. It's a very wet brush, like a wet fountain pen nib, and so lots of color comes down the tip making controlling the width of the line difficult. As one of it's features is to blend the color, I'll have to purchase a few more (there are 24 colors in all) and see how they work together. 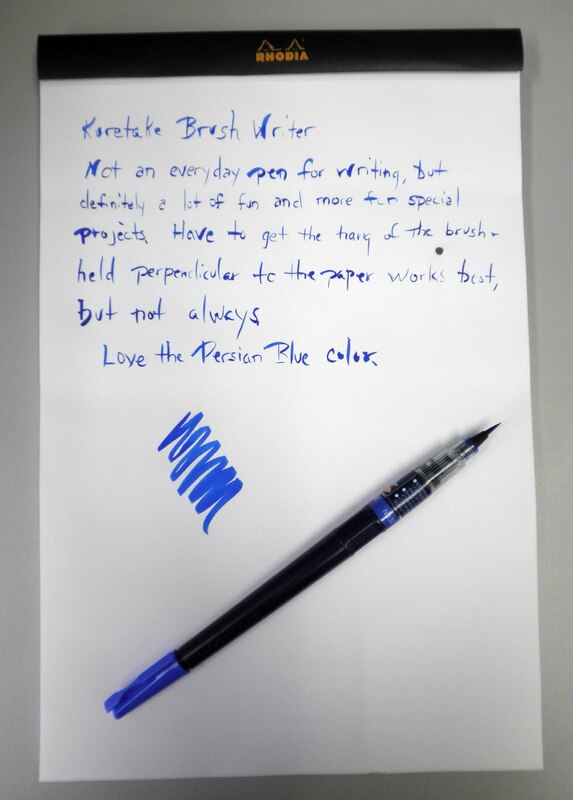 But the Persian Blue color is awesome, and I can see this making a fantastic calligraphy pen using this color. Rhodia Large Blank Webbie and a Giveaway! Many, many thanks to the fabulous Stephanie for inviting me to review the new Rhodia Blank Webnotebook and offering an extra for a giveaway. As always, the incredible Karen Doherty made this possible. One of the new orange Rhodia webnotebooks to play with. Hmmm. A new blank orange Rhodia webnotebook to play with. Hmmm, hmmmm. A new blank large orange Rhodia webnotebook to play with. Can life get any better than that? How about one webbie to review and one for a giveaway! The New Rhodia Blank Webbie seems pretty much the same as the Classic Rhodia Webbie, just blank paper--but don't let that fool you. There is one major difference and a few minor ones that make this a different writing experience. Among the minor changes (at least to me) is the blank paper--I love my Classic Webbie but the lined paper somehow seems inhibiting. I've been writing away in it for months now, and something seems to be missing. When I doodle, it's as if I'm constricted in my movement. Now, the blank paper lets me write or draw any way I want to, and that's a big plus. A second minor (to me, that is) change is the removal of the Rhodia logo on the bottom right pages. I never minded that too much, but it does give the webbie a cleaner look and feel. It adds about a half inch or so of writing space, and there's no more distraction (I guess--I actually liked it, but I seem to be in the minority on this). The really important change is this: the pages now lie absolutely flat, as the above picture demonstrates pretty well. On the left is my Classic Webbie with pages sticking straight up no matter how many times I bend the spine and smooth the paper down. On the right is the New Webbie: just one bend-and-smooth motion and the pages lay perfectly flat on the table and never moved at all. Congrats Rhodia, you just made an excellent journal even better! So what about the writing experience? Well, it's the same fantastic Clairefontaine paper, 90gsm silky smooth ivory vellum that's fountain pen friendly. I did notice a heavy shadow on the opposite side, but no bleed through at all. Overall it's a truly delicious writing experience. Two journal sizes are available as with the lined webbies; the larger blank journal pictured above clocks in at 5.5 x 8.25 (available at Goulet Pens) and the smaller, blank pocket webbie which measures 3.5 x 5.5 (and available at JetPens). If you want more New Webbie pics and a very thorough review then check out Peaceable Writer's post and (enter her Webbie giveaway as well). For another review (but no giveaway, lol), check out The Pen-Guin. Vicki Holdwick of Faint Heart Art is also reviewing and giving away a Webbie 3.0, you can enter here. Here's Madame Purl's review and giveaway, do take a look! One (1) orange Rhodia large blank webbie will be given away to one lucky winner who leaves a comment by Sunday, August 15 by 5:30 pm EST. A winner will be chosen using a random number generator; the format is as follows: first post is #1, second post is #2, third post is #3, etc. 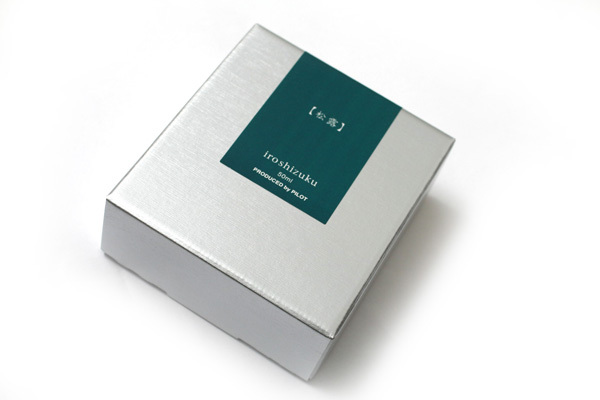 I will ship internationally, so do leave a comment and don't worry about the postage. The winner will be announced on Monday, August 16, and you will have one (1) week to send me your mailing information. In the event no one gets in touch with me, a new winner will be announced. 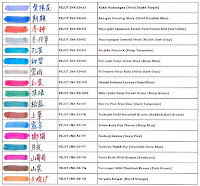 TAO at Bleubu g.com recently rocked the twitterverse with his amazing review of Noodler's fountain pens, both piston filler and aerometric with all the colors they come in lined up for inspection. I'm definitely not in his league, but I thought I'd just give a few observations on my Noodler's aerometric fountain pen. 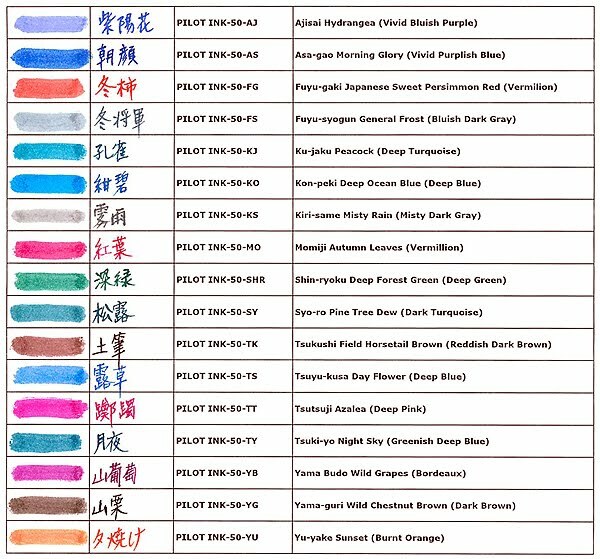 As background, Noodler's fountain pens are available from JetPens.com and come in two flavors: the piston filler with ink windows available in five different colors for $14, and the aerometric/eyedropper with rounded edges that comes in two mottled colors for $24. The nib is a fine-medium, a good choice I'd say as it can be hard to decide on a nib sight unseen (at lease for me, YMMV). As the mottled brown was the only one available at the time, I ordered that one and waited for my Noodler's fountain pen to arrive. I seem to recall some buzz at the Fountain Pen Network about these pens, and I was really looking forward to getting one. The mottled colors didn't thrill me; they don't look antique or vintage so much as old and cracked and dirty. But again, that's just me. As I wasn't really interested in the piston filler (for some reason just didn't like the way it looked), I went with the big aerometric pen. So when the pen arrived, in a catfish-covered box, I was really looking forward to trying it out. The first surprise I had can be seen in the above picture of the section where the sac is glued on. Couldn't someone have wiped off the gobs of glue so it didn't look so sloppy and amateurish? I've only done this once myself, but I took the time to wipe away the glue that was on the outside so it didn't look so cheap. You might also be able to see in that picture the grooves around the section where it screws into the barrel. They are badly cut, with lots of the debris still attached to the plastic. Again, this just makes the manufacturing process look cheap and amateurish. The nib is quite nice, and I do like the fine-medium point. It's probably my favorite part of the pen, as I'm the ultimate Libra and can never decide on a fine or medium nib. This reminds me of my Pelikan 205 clear blue fountain pen with a medium nib, it's actually more a fine-medium nib and I love the width of the line. 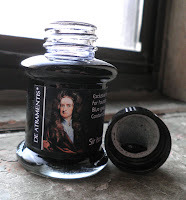 As I'm using Noodler's ink, there's ink creep and a very dry nib to deal with, as well as small drops of ink all over the place from shaking the pen to get the ink to flow. Several websites, like The Pen Addict, have a list of "best 5 pens" or "worst 5 pens." I'm thinking of doing a "mediocre pens I might either recommend or trash, or both." Pens that I want to like but really can't get more enthused about other than a "maybe yes, maybe no" attitude. Noodler's aerometric fountain pen will top the list. I realize that given all the very expensive pens I've purchased a $24 stinker isn't that big a deal; but it is a lot of money for many, many other people who would like a nice, "branded" fountain pen. This isn't it as far as I can tell, and that's a shame--because I so wanted to love this pen but really don't. UPDATE: Check out Note Booker Esq. 's extensive and excellent review as well, with great pictures and additional comments on the Noodler's pen experience. One product Kevin from O'BON sent me was this triangle pack of Wildlife Pencils; all O'BON pencils are made the same way with a graphite core wrapped in recycled newspaper. 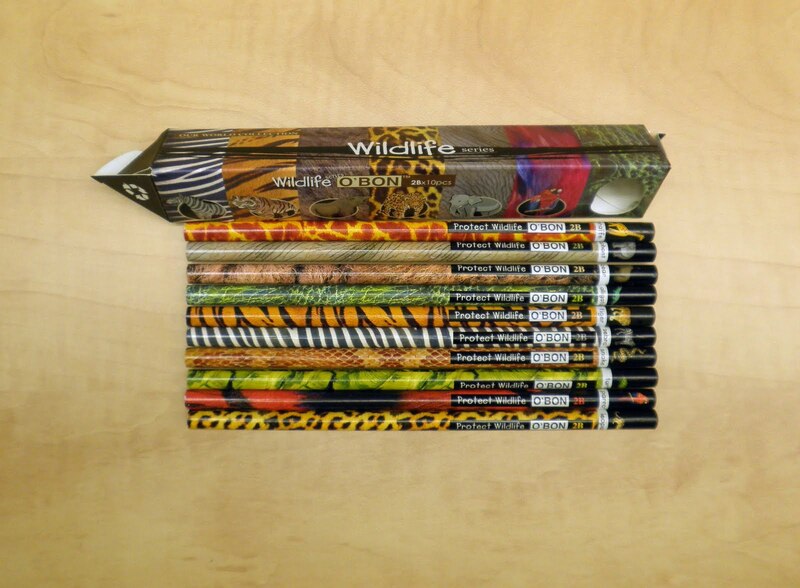 This set contains 10 2B pencils in animal prints and patterns and their signature "Save Wildlife" phrase. I think these recycled newspaper pencils are a lot of fun, starting with the different patterns (I chose a tiger print but could have gone with a snakeskin, giraffe, bear, parrot, or grass prints to play around with) and then the really cool sharpener effect. The recycled newspaper doesn't easily break off when you sharpen the pencil, so you're left with one very long whirl of newspaper that for some reason I enjoy (rather than yellow and graphite shavings). The 2B graphite is fine for writing, hard enough so I can press down without shattering the point but soft enough for some shading in my letters. No smeary writing, a "green" pencil, and a cute theme make this O'BON a winner. But someone's gotta do it, so why not Mally? Glad she's picking up the slack for all the insomniacs out there. Daydreamers Welcome: Carnival of Pen, Pencil, and Paper! Hey, the Carnival is here already! Take a trip over to Daydreamers Welcome: Carnival of Pen, Pencil, and Paper! for some really great posts! The September Carnival will be hosted on September 7 by OfficeSupplyGeek, and submissions can be made here. 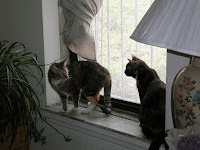 Mally is on the left, and Seranne on the right sitting on the windowsill. 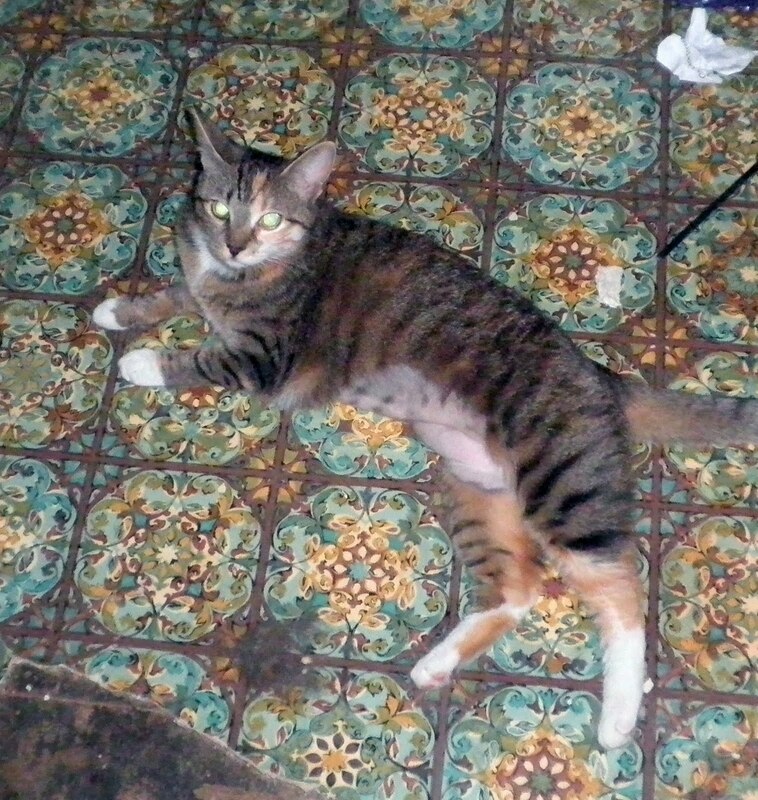 A new addition to the household is this little girl, who I've renamed Mally (from Mambo). 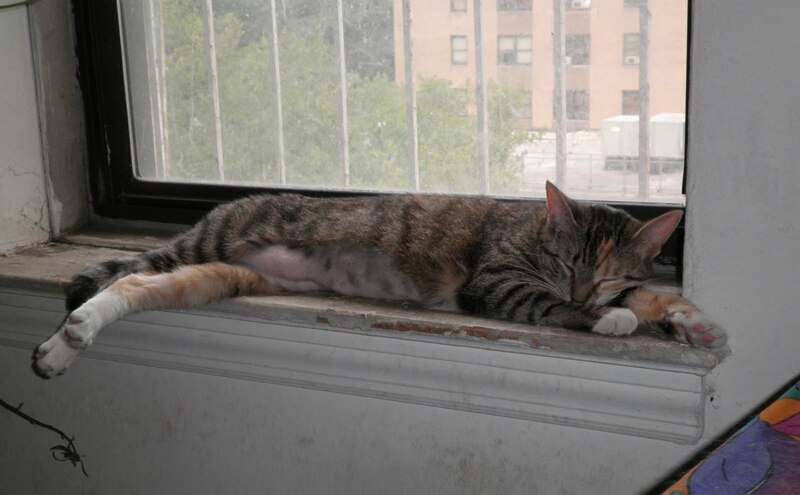 She's a stray picked up by the ASPCA and made available through their adoption van. Of course I was going to Staples for some Sharpies, but the bus never showed up and the adoption van was right across the street. She's 19 months, a combination of tiger stripe and pale tortoise shell. The other two cats have really taken to her, which helps when the lights go out and territories may be inadvertently breached.